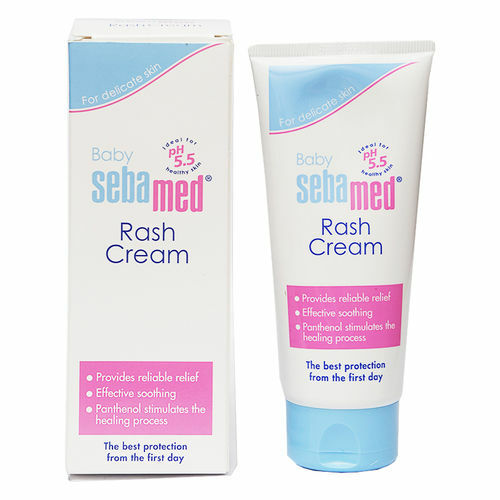 Sebamed Baby Diaper Rash Cream provides effective relief and reliable protection against diaper rashes. It is a rich emollient water in oil formula and is indicated for prevention and relief from diaper rash. The pH value of 5.5 of Sebamed Baby is clinically proven to promote the development of skin's acid mantle which protects the skin from entry of harmful bacteria and prevents moisture loss. Contains titanium dioxide that forms a protective barrier against aggressive substances that cause inflammation of the baby's delicate skin. 35% oils helps to hydrate, soothe and moisturize the irritated skin. Sebamed Baby Diaper Rash Cream is free from Formaldehyde/ Nitrosamines/ Dioxan. Explore the entire range of Rash Creams available on Nykaa. Shop more Sebamed products here.You can browse through the complete world of Sebamed Rash Creams .